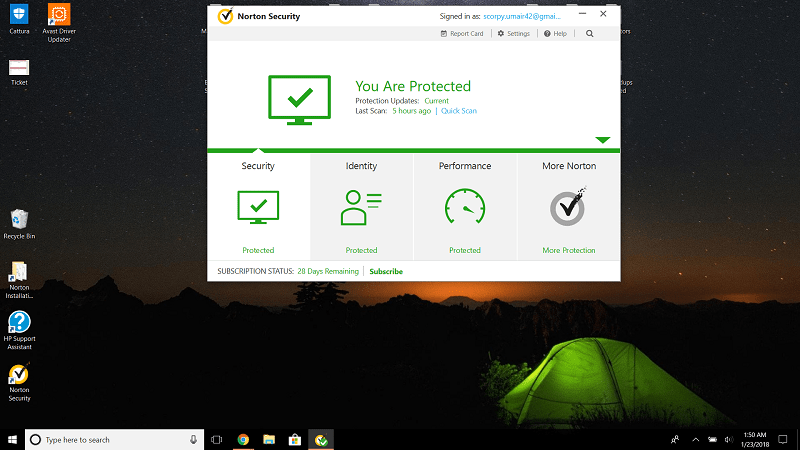 Bitdefender or Norton, which antivirus software is a better option in 2019? Read this comprehensive, fact-based comparison to make a wise decision. The so-called digital world we live in is becoming increasingly complex with time, and it goes without saying that your security and privacy are at stake. Do you know the AV-Test institute registers over 350,000 new malware samples every single day? Hackers are constantly releasing new malware (a collective term used for viruses, worms, ransomware, Trojan horses, and more) on the internet that can do a lot of terrible things, such as corrupt your computer, breach your privacy, steal your sensitive login details, and so on. So it makes sense to say that having a reliable antivirus suite on your computer is no longer an option but a requirement. In this ultimate comparison, you’ll see the antivirus products both Bitdefender and Norton offer, as well as how they compare to each other in terms of malware protection, system performance, user interface, and more. First, let’s see the security products both Bitdefender and Norton offer. If want the answer straightaway, take a look at the infographic below and also read our short verdict to make your mind. Norton is competitive, but Bitdefender offers a more comprehensive feature-set and better malware protection with minimal impact on system performance. Also, Bitdefender offers better value for money than Norton. What is Included in Bitdefender’s Antivirus Suites? Bitdefender Antivirus Free is the company’s free antivirus product. The bare-bones freeware offers limited malware protection and doesn’t include any advanced protection-related features or extra utilities that have become commonplace tools in modern antivirus suites. However, protection against malicious websites and phishing attacks is included in the free product. Bitdefender’s entry-level paid-for offering is Bitdefender Antivirus Plus 2019. Along with great malware protection, it offers a hardened browser for secure online shopping/banking, a password manager (stores all your passwords at one place), a file shredder (deletes your sensitive files securely so no one can recover them), a WiFi Security Advisor (helps fix vulnerabilities in your network), and a battery saver utility. Silent mode feature (for interruption-free experience) and a vulnerability scanner (checks outdated software and other flaws) are also part of the product. Next level up is Bitdefender Internet Security 2019. In that, you get everything that is included in the ‘Plus’ suite, along with a two-way Firewall (monitors network connections and blocks malicious attempts made via network), a file encryption utility (shields your sensitive files from ransomware) and webcam protection. Parental control features and an anti-spam module (blocks junk emails) are also jammed into the “Internet Security” suite. 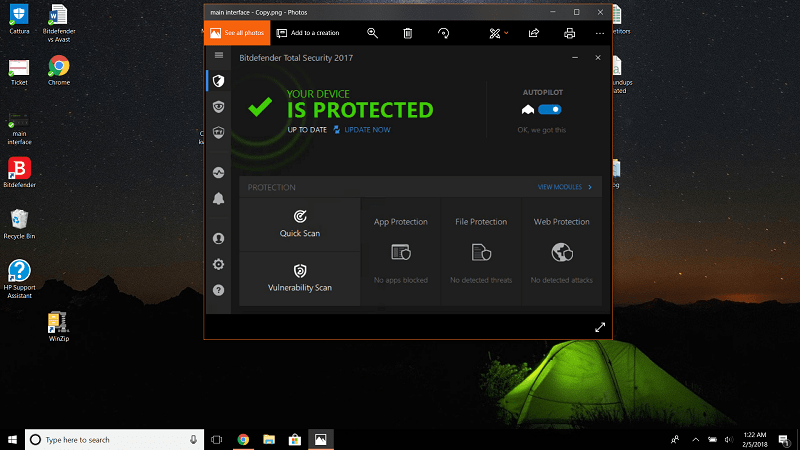 Another level up is Bitdefender Total Security 2019 – the company’s most popular suite. Along with everything that is included in the ‘Internet Security’ suite, it further adds a useful anti-theft module (helps find stolen/lost devices) and several performance optimization tools, such as DiskCleanup and OneClick Optimizer. You can protect a maximum of five devices (PCs, Macs, iOS, or Android) with a single license of Bitdefender Total Security 2019. Also, the “Total Security” suite is compatible with both Mac and Windows. If you want to protect more than five devices, then Bitdefender Family Pack 2019 might be the best option for you. It includes everything that is part of the high-end ‘Total Security’ suite and offers protection for an unlimited number of PCs, Macs, iOS and Android devices with just one license. Now, let’s see what Bitdefender offers for Macs. Bitdefender offers a separate product for Mac users, called Bitdefender Antivirus for Mac. It offers excellent malware protection, along with a VPN and a few other advanced protection-related utilities. Bitdefender Total Security 2019 and Bitdefender Family Pack 2019 are also compatible with the Mac operating system. 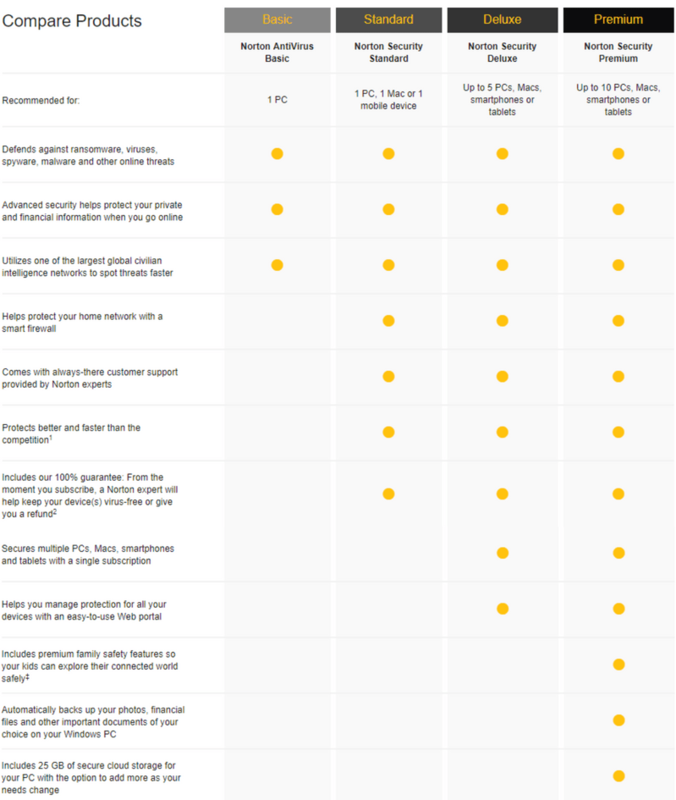 What is Included in Norton’s Antivirus Suites? Like Bitdefender, Norton also offers a range of antivirus suites to meet your needs, but there is no free offering. The first suite in the line is Norton AntiVirus Basic – the company’s entry-level premium product. It offers great protection against viruses, ransomware, worms and other online threats, but there aren’t any advanced security-related features or extra utilities packed into this suite. Next up is Norton Security Standard, which is compatible with both Mac and Windows platform. Along with excellent protection against all sorts of malware threats, it offers a two-way firewall (prevents hackers from gaining access to your computer via network) and premium customer support. You can protect 1 PC and 1 Mac or mobile device (Android or iOS) under the “Standard” suite. Another level up is Norton Security Deluxe. It includes everything that’s jammed into the “Standard” suite, along with a web portal (to help you manage protection for all your devices at one place) and protection for up to 5 PCs, Mac, smartphones or tablets. 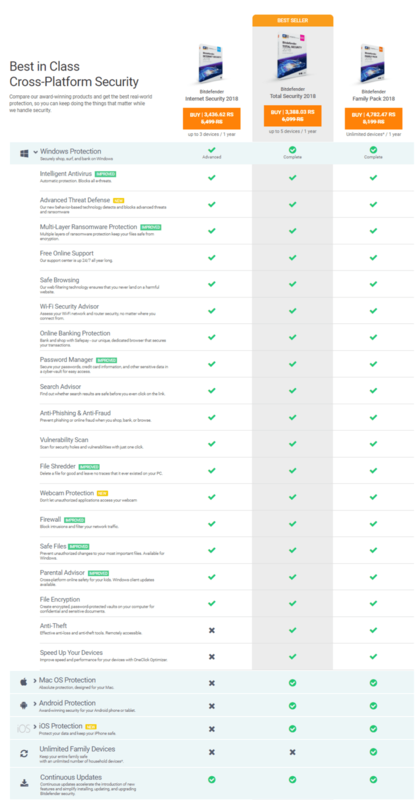 Norton Security Premium is the company’s top-drawer (and most popular) antivirus suite. In that, you get everything that comes with the “Deluxe” suite, plus premium family safety features (helps kids explore the internet safely), automatic backup of your important files, and 25GB of secure cloud space for data storage. You can protect up to 10 PCs, Macs, mobile phones or tablets under the “Premium” suite. The two main browser extensions that Norton offers are Identity Safe and Security Toolbar. The former is a password manager while the latter secures your online experience and also prevents identity theft. Interestingly, common tools/features like WiFi scanner, file shredder, webcam protector, VPN, and secure browser are not part of even the top-of-the-line Norton suite. Bitdefender vs Norton: Which Software Offers Better Malware Protection? Malware protection engine is the heart of a security product. To see whether Bitdefender or Norton is better in terms of malware protection, I’ll look at the most recent independent lab tests conducted by AV-Test and AV-Comparatives — two well-known (and most respected) independent security labs that deeply evaluate various top antivirus products, including Bitdefender and Norton. AV-Test’s most recent evaluations were conducted on Windows 10 platform during March and April 2018. All participating products were tested against 196 samples of zero-day malware (or new malware) and 5,484 samples of widespread malware (also called old malware) over both months. The two main tests that AV-Comparatives conducts are Real-World Protection Test and Malware Protection Test. The latter test comprehensively evaluates a product’s ability to prevent malware infections, while the former test exposes a product against real-world malware conditions (as experienced by everyday users). 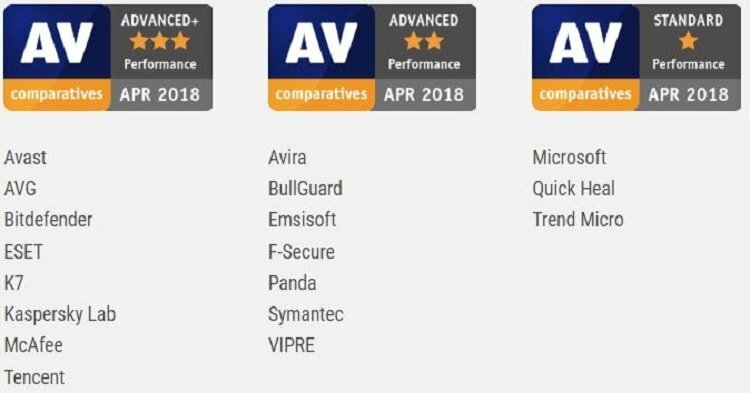 AV-Comparatives most recent Real-World Protection Test Report listed aggregated results of the tests conducted over the period of five months (from February to June 2018). Bitdefender received the highest ADVANCED+ award from the security institute, due to its near-perfect protection rate of 99.8% and low false positives’ count (2). Norton, on the other hand, also registered an impressive protection rate of 99.8%, but it came up with a whopping 32 false positives. It could only manage the second-best ADVANCED award. ***false positive refers to the case where a security product wrongly flags a clean file as malware. AV-Comparatives Malware Protection Test was recently held in March 2018. Bitdefender once again put up an impressive show, with a perfect 100% protection rate and just two false positives. It received the highest ADVANCED+ honor. On the other hand, Norton’s protection rate was near-perfect, at 99.9%, but it came up with 90 false alarms, meaning it had to settle for the third-best STANDARD award in this test. So, it’s clear that Bitdefender is better than Norton in terms of malware protection. Bitdefender vs Norton: Which Software Puts Less Impact on System? It is part of a security product’s job to protect your computer against real-time malware attacks, which means it has to continuously run in the background just like any other computer application. So if an antivirus software is resource-intensive, needless to say your system’s performance (or speed) will suffer – especially if your computer is behind the times. To see how much impact both Bitdefender and Norton put on computer performance, I will look at the most recent performance tests conducted by the independent security institutes. AV-Test’s ‘Peformance’ study measures the influence of a security product on computer speed while carrying out a few common computer tasks, such as lunching popular websites, launching applications, downloading/installing software. The influence of each product was measured in terms of system slowdown on a standard PC as well as on a high-end PC. Both Bitdefender and Norton received the highest 6/6 star rating from the AV-Test experts in the ‘Performance’ category. 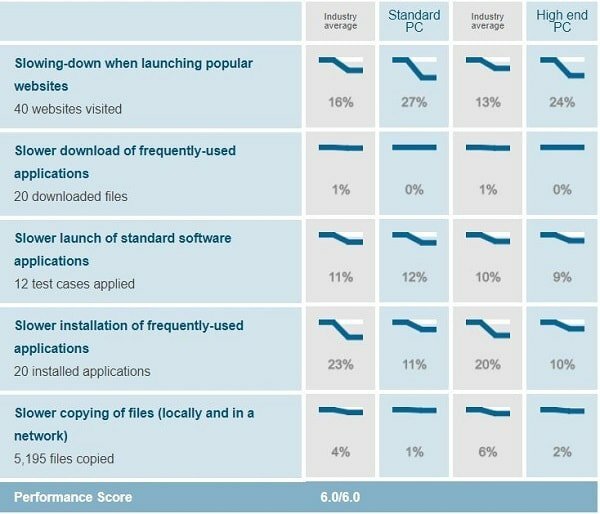 The experts at AV-Comparatives do a similar study; they check the impact of a security product on computer performance while executing common computer tasks, like archiving/unarchiving, downloading files, installing/uninstalling software, copying of files, and more. An impact score (the lower, the better) is given to each product based on its performance in the test. Bitdefender received the highest ADVANCED+ award from the experts, due to its near-perfect impact score of 6.9. Norton, on the other hand, could only manage the second-best ADVANCED award, because of its slightly worse impact score of 16.1. Both software registered perfect results in the AV-Test’s study, but Bitdefender came out of AV-Comparatives’ study with better results than Symantec. Bitdefender vs Norton: Which Software Boasts Better Interface? Another important consideration is the user interface. Bitdefender interface is dark and modern, in shades of black and light grey. There is a vertical menu on the left which consists of the following tabs: Protection, Privacy, Tools, Activity, Notifications, Account, Settings, and Support. Protection window is the first screen you see when you open the software. If everything is okay, you’ll see “You’re Protected” written next to a checkmark. Right next to it is a toggle switch for Auto-Pilot feature, which – when turned on – handles everything on its own, without interrupting you with mindless notifications. Buttons to run a Quick Scan or a Vulnerability Scan are also made available to you on the view. Privacy and Tools tabs contain relevant features and their settings. The rest of the tabs are pretty much self-explanatory. The name of the suite you’re subscribed to is displayed in the top bar. Norton’s interface is simple and bright, in colors of white and green. The default screen shows your protection status, along with last scan time and a link to run a Quick Scan. There are four modules on the main page: Security, Identity, Performance, More Norton. Security tab lets you run different types of scans, check error logs, manually update malware definitions, and more. Identity module contains privacy-related features, including Norton’s password manager, while Performance window includes several computer performance improvement tools. Clicking More Norton tab takes you to Norton’s online portal where you can manage protection for all your devices at one place. The bottom bar shows your subscription status, while the bar at the top contains links to Settings and Help. Overall, both Bitdefender and Norton offer a simple and easy-to-use interface. Bitdefender vs Norton: Which Software is Less Expensive? Both companies offer products at nearly the same price points, but Bitdefender’s suites cover more devices than Norton’s. Bitdefender vs Norton: Which Software is More Popular? Both Bitdefender and Norton are well-known brands in the market. To see which of the two is more popular, I will look at the independent market share statistics and the number of followers of both software on social media. OPSWAT is a company that regularly releases monthly reports on the market share of top antivirus products. According to their most recent report, Bitdefender stands fifth on the list of top antivirus products, with a market share of 7.95%. Avast sits on top with a market share of 17.79%, followed by ESET (12.71%) and Malwarebytes (12.55%). Surprisingly, Norton is not on the list of top ten security products. Speaking of social media numbers, Bitdefender has 4.1 million Facebook fans and 82K Twitter followers. Norton, on the other hand, has 1.3 million Facebook fans and 158K Twitter followers. Overall, it can be said that Bitdefender is more popular than Norton. Independent studies have shown that Bitdefender is better than Norton in terms of malware protection and the impact on system performance. Also, Bitdefender offers more security-enhancing features and extra utilities in its suites than Norton.